One of the disconcerting things about the growing popularity of Permanent Style is the regularity with which readers find old posts – usually via search engines – and question me about them. I dislike being called an expert today, whether it’s on questions on style, manufacture or fashion history, but I certainly know a lot more than when I started writing, over five years ago. This is the first in an irregular series of posts on things that I got wrong. Or rather, more accurately, things about which I have changed my mind. Almost exactly four years ago I wrote a post (Why sweaters cannot be stylish and practical) arguing that while the sleeveless cardigan was eminently practical in its colour, warmth and lack of bulk under a jacket, it could never be stylish worn on its own. The ordinary cardigan looks far better, I argued, but of course its sleeves make it less practical under a jacket. The logic is faultless, but I think I was a little harsh on the sleeveless cardigan. It can, like many other items of classic style, appear a little fuddy-duddyish, but a little attention to how it is worn is all that is needed to avoid this association. First, stick to dark, classic colours. Navy, as with any sweater, is the most versatile colour and should be bought first. After that, either a mid-grey or another dark colour such as bottle green. Second, balance the rest of the outfit. If you are concerned about its associations, don’t wear a sleeveless cardigan with a tweed jacket and bow tie; try raw denim jeans and a washed cotton jacket instead. And third, wear it to its greatest advantage: under a jacket. In this context it performs many of the same functions as a waistcoat, creating an attractive V on the chest and hiding the often messy area around the waistline. If you are not wearing a tie, it is one more much-needed piece in the ensemble. If darker than the jacket, it attractively shadows the line of the lapels. 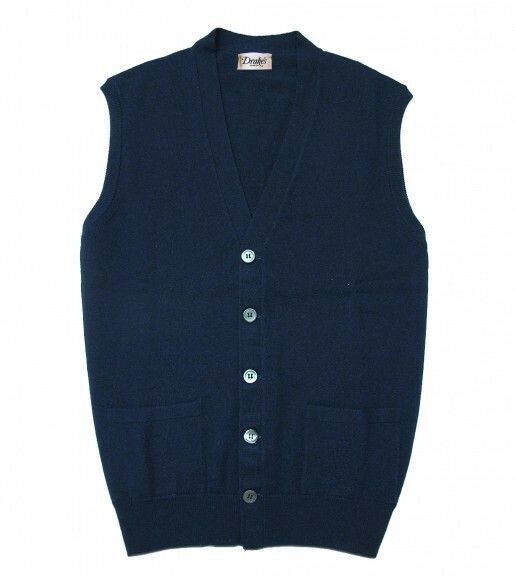 I have three sleeveless cardigans, all from Drake’s, in navy, biscuit and cream. The navy is worn every week, usually with a jacket and jeans; the biscuit I like only under a suit but provides a nice accent to grey flannel; and the cream is worn even more rarely, but works best with a white shirt as a subtly alternate tone. Oh, and always undo the top and bottom buttons. Even two at the top: it encourages a lazy flop in a tie that is consistently appealing. You can follow the discussion on Things I was wrong about: The sleeveless cardigan by entering your email address in the box below. You will then receive an email every time a new comment is added. These will also contain a link to a page where you can stop the alerts, and remove all of your related data from the site. One of my favourite outfits is a white button down shirt, navy knitted silk tie, navy sleevless cardigan, fawn coloured cords, espresso coloured suede loafers and a single breasted navy blazer. What about chocolate brown – would that be a versatile colour? Italians are now adopting (promoting) the sleeveless card…, but I’ve always seen it present on the streets here in Rome. If everyone, every job,every day including Saturday and Sunday, had to wear a suit, or a jacket and tie, you would be amazed at the inspiration you could find. Who would have known some things never go out of style, or is it fashion? not sure about these. i prefer full length sleeves & at £295 it’s a hell of a risk. I’ve long wondered why John Smedley doesn’t offer a sea island cotton waistcoat. All they would have to do is chop the arms off of their regular cardigan. It would be a welcome choice for Spring and transitional weather with a lighter suit. Simon, can you ask them?